4) Previous history of the core (residual flux), initial recovery of the sympathetic flux wave,etc. Hence it is very essential that a careful a careful analysis of the characteristic is made in selective the primary protective device for transformer. 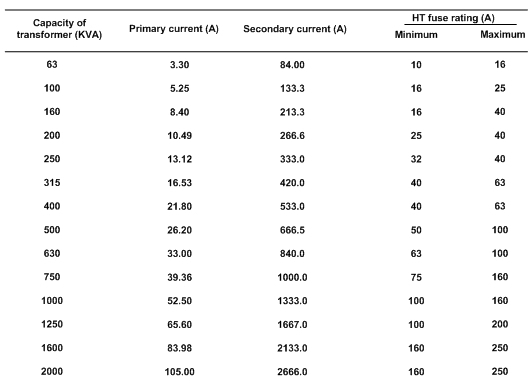 Table 1 and 2 give the relationship between the capacity of the transformers with the time constant of the inrush current and the ratio of inrush current to be the normal current for oil filled and cast resin type transformers respectively. The relation between the primary current threshold setting and the time delay setting of the protective device is shown in the Fig. 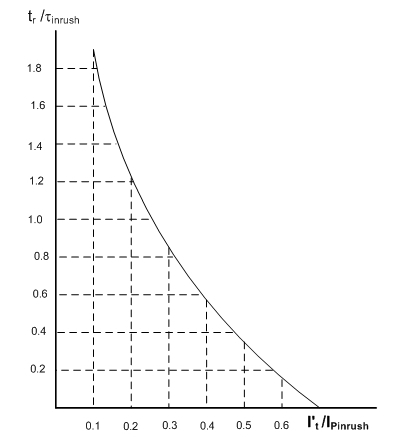 1, where the y-axis represents the ratio of time delay setting to the inrush time constant and the x-axis represents the ratio of setting threshold of primary current to the inrush current. Consider for example a 500 KVA oil filled transformer with a voltage ratio of 11 KV/433 V ans suitable for 50 Hz three phase operation. Therefor,time delay setting = 1.8 x 0.25 = 0.45 seconds. This is the minimum time delay required by the primary protective device to avoid unwanted tripping or malfunctioning of the protective device on the primary side, the fuse manufacturers provide information regarding the minimum and maximum size of the high voltage fuse ratings. Table 3 provides a typical data of the fuse ratings on the primary side of transformers. 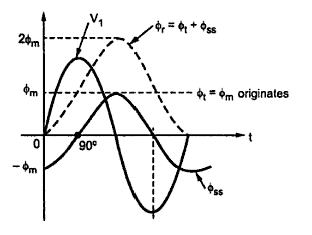 In the steady state operation, both V1 and Φ are sinusoidal and Φ lags V1 by 90° as shown in the Fig.2. When the primary voltage V1 is switched on to the transformer, the core flux and the exciting current undergo a transient before achieving the steady state. They pass through a transient period. The effect of transient is severe when voltage wave pass through origin. In the inductive circuit flux can start with zero value. But the steady state value of flux at start is -Φm , as shown in the Fig. 2, at t = 0. Thus during transients a transient flux called off-set flux, Φt = Φm originates such that at t = 0, Φt +Φss is zero at the instant of switching. This transient flux Φt then decays according to circuit constants i.e. ratio L/R. This ratio is generally very small for transformers. Thus during transients, the total flux goes through a maximum value of 2Φm. Such effect is called doubling effect. This is shown in the Fig.3. Due to the doubling effect, core flux achieves a value of 2Φm due to which transformer draws a large exciting current. This is due to the fact that core goes into deep saturation region of magnetisation. Such a large exiting current can be as large as 100 times the normal exiting current. To withstand electromagnetic forces developed due to large current, the windings of transformer must be strongly braced. This large current drawn during transient is called inrush phenomenon. Practically initial core flux can not be zero due to the residual flux Φ'r present, due to retentively property of core. The transient resultant flux goes through Φr = Φ'r + 2Φm and there is heavy inrush current in practice. The effect of transient is even severe in practice. Such high transient current gradually decreases and finally acquires a steady state. It can last for several seconds. The transient flux Φt and exciting current both are unidirectional during transients. In steady state, exciting current becomes sinusoidal. The Fig. 4 shows the oscillogram of the inrush current. 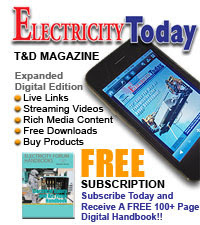 The bottom line is to bring electricity to the consumer safely. 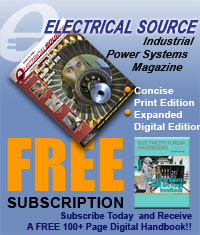 That requires the use of distribution and power transformers, along with necessary components. The major factors to be considered are power requirements, voltage specifications, topography, climate, and the sound levels. I will follow your blog always. Thanks!!! Really i like your post it give me many ideas related to machinery.I love to read that. Nice blog! Its really an informative blog regarding electrical equipment as we are also manufacturer and distributor of electrical components. A transformer draws inrush current that can exceed saturation current at power up. The Inrush Current affects the magnetic property of the core. This happens even if the transformer has no load with its secondary open.